Characters from Disney Junior’s hit series, Sofia the First and Jake and the Never Land Pirates are currently on tour and celebrity families were some of the first in line to catch two of DJ’s most popular casts take the stage for Disney Junior Live On Tour! Pirate & Princess Adventure! Get swept up in the excitement as Sofia and her family prepare for a royal celebration that helps us all learn the true meaning of being a princess with a special appearance from Cinderella. Then it’s off to Never Land where Jake and his swashbuckling friends Izzy and Cubby, with a little help from Peter Pan, battle Captain Hook to unlock treasure hidden inside a mysterious volcano. It’s danger and dueling on the high seas as Jake discovers what it takes to be a true hero. Rumored mom-to-be Gwen Stefani was photographed arriving with her niece and two boys; Kingston and Zuma. Tori Spelling and Dean McDermott took in the show with their 5 kids; Jack(from Dean’s previous marriage), Liam, Stella, Hattie and Finn. 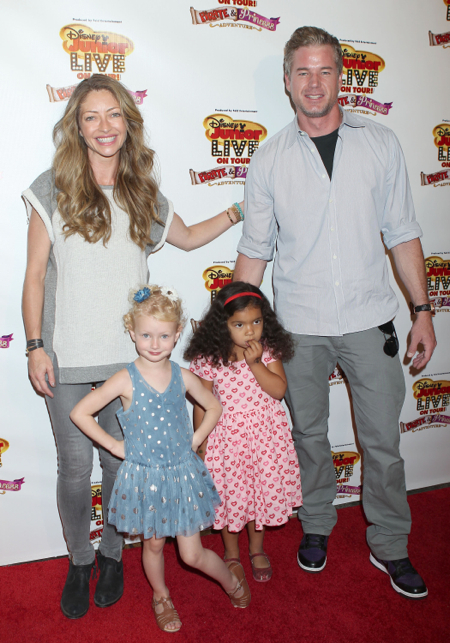 Eric Dane and Rebecca Gayheart arrived with their daughter Billie and a friend.